Department of Pharmaceutical Chemistry and Analysis, Amrita School of Pharmacy, Amrita Vishwa Vidyapeetham, Kochi-682041, Kerala, INDIA. Tagetes erectus (family: Asteraceae), commonly known as ‘African marigold’, is an ornamental plant widely distributed in India. The plant has been used in traditional medicines in India and elsewhere in the treatment of cold, bronchitis, rheumatism and inflammation. 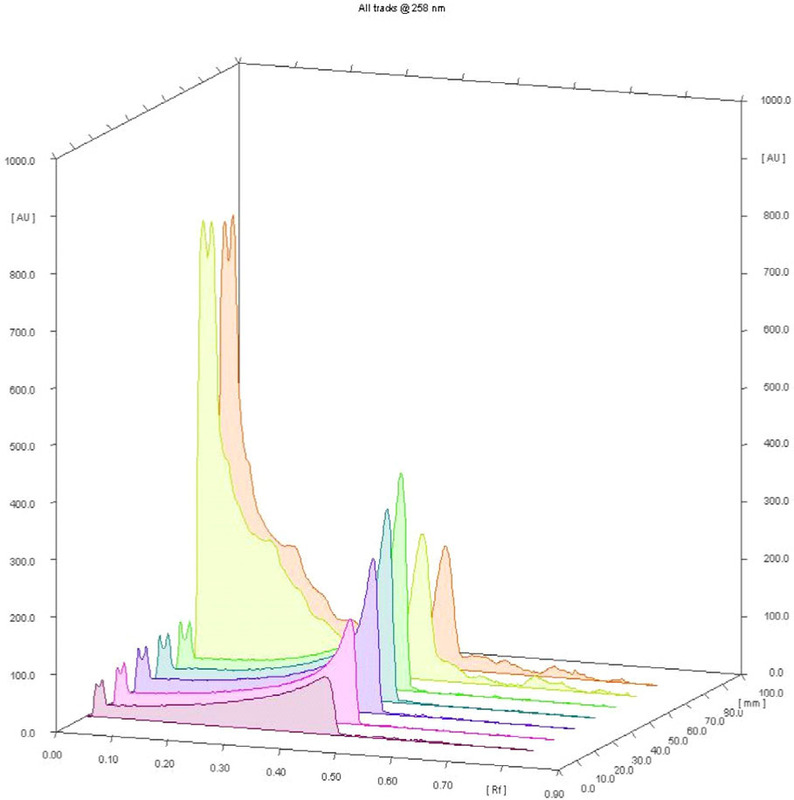 The flavonoid quercetin has been isolated from the methanol extract of the plant by column chromatography and identified by co-TLC, comparison of its melting point, UV, IR and NMR spectra. 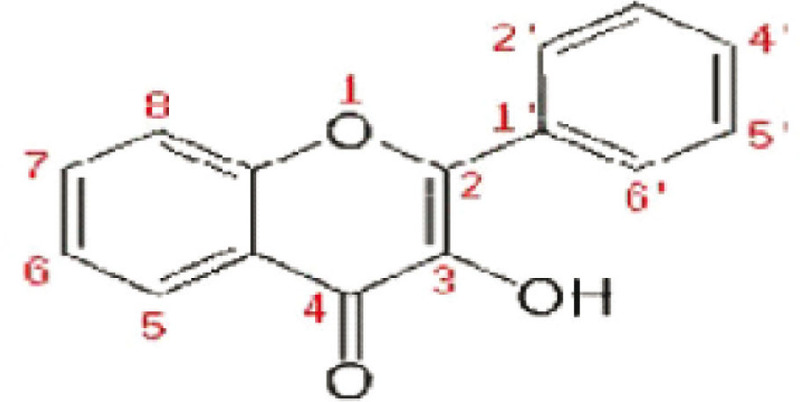 Quercetin content has been estimated as 1.22 (±0.26) % in the methanol extract of Tageteserectus whole plant based on HPTLC method using the solvent systemchloroform: methanol (8.5:1.5). The essential oil was isolated by hydrodistillation (oil yield 0.04% v/w) and 25 compounds comprising 93.9% of the constituents were identified by GC-MS analysis. Monoterpenoids Predominated the oil (78.5%), with piperitone as the major compound (40.1%) followed by terpinolene (12.7%) and limonene (12.0%). The in vitro antioxidant assays of the methanol extract showed moderate activity with IC50 values 109.45 (±1.22) µg/ml for DPPH radical scavenging assay and 201.53 (±4.48) µg/ml for superoxide scavenging assay and the marker compound quercetin showed IC50 values 26.40(±1.75) and 13.87 (±0.54) µg/ml respectively. Reducing power assay also showed moderate activity. Antibacterial activity of the methanol extract and the essential oil against gram positive and gram-negative bacteria were done using disc diffusion method. The essential oil showed remarkable activity against the tested organisms, while the extract showed only moderate activity. It is the largest group of naturally occurring phenolic compound with a basic skeleton of 2- phenyl benzo-γ-pyrons. The various types of flavanoids differ in the degree of oxidation and in the pattern of substitution. Essential oil is the steam volatile component of plants responsible for the aroma of the plant and constitute mainly of terpenoids and some simple phenolics and hydrocarbons. essential oils are formed in glands or special cells. They may have some antibacterial or antiseptic action. These aromatic oils are used in the preparation of perfumes, cosmetics, and as medicine and as food adjuncts. Chemically essential oils are mixtures aliphatic hydrocarbons, monoterpens, sesquiterpene and their oxygenated derivatives. These terpenoids are composed of isoprene units. Monoterpenes are made of two isoprene units and sesquiterpenes by three isoprene units. The plant was collected from Tirunelveli, Tamilnadu during February 2011 and authenticated by Dr. V. J. Dominic, Head, Dept. of Botany, S.H. College, Thevera, and a voucher specimen was deposited at Herbarium of Tropical Botanic Garden and Research Institute (Herbarium No. TBGT 66412). About 1 g of the extract is dissolved in 1 ml water. Two drops of 1% alcoholic solution of α-naphthol is added. Then, 1 ml conc. H2SO4 is carefully added along the sides of the test tube so that it forms a heavy layer at the bottom. Deep violet colour at the junction of two liquids indicates the presence of carbohydrates. 10 mg of extract is dissolved in dry CHCl3, into this acetic anhydride is added followed by a few drops of con. H2SO4. Green colour shows the presence of steroids and pink colour shows the presence of terpenoids. Reagent are added. Orange red precipitate shows the presence of alkaloids. 10 mg of the extract is dissolved in conc. HCl and filtered. A few drops of the solution are poured into the centre of a watch glass. Mayer’s reagent is added in drops to the sides of the watch glass with the help of a glass rod. Formation of gelatinous white precipitate at the junction of two liquids shows the presence of alkaloids. To the extract add few drops Wagner’s reagent (dissolve 2g of iodine 6g of potassium iodide in 100ml of water) gives reddish brown precipitate. To the extract add few drops of Hager’s reagent (saturated solution picric acid) gives yellow precipitate. 10 mg of extract is dissolved in MeOH. Mg turnings are added into this,and then conc. HCl is added in drops. A pink color shows the presence of flavanoids. b) One drop of above extract placed on a filter paper is exposed to ammonia vapour. A yellow colour shows the presence of flavonoids. Extract is dissolved in water and shaken well. Froth formation, which lasts for a long time, shows the presence of saponins. The standardisation of plant or plant parts was done. This is to check the whether the plant parts correspond to the various parameters mentioned in the WHO guidelines. The various parameters evaluated include Ash value, Bitterness value, Swelling and Foaming index etc. 15 mg of the methanol extract was dissolved in 1.5 ml of methanol. Methanolic solution of the extract and standard compound of quercetin were applied on the Pre- coated TLC plate. 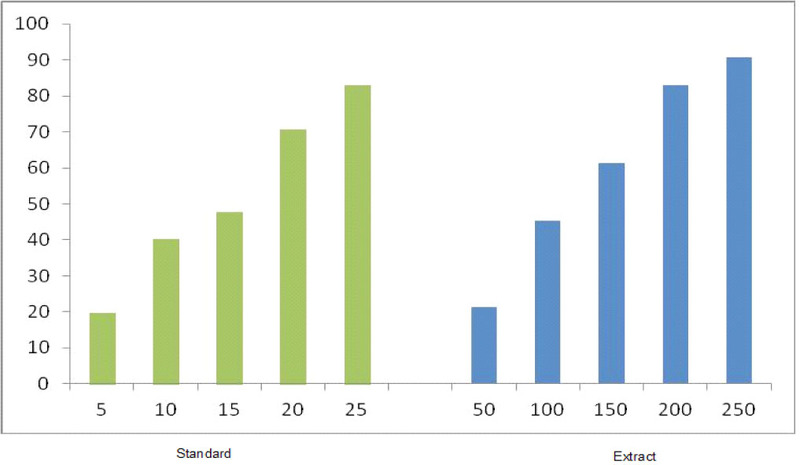 15μl and 20μl of the test solution and 1μl-4μl 0f standard quercetin were applied on the pre-coated silica gel F254 TLC plate (E. Merck) of uniform thickness of 0.2 mm. The plate was developed in the solvent system to 8 cm. The solvent system is Chloroform: methanol. After the development the plate was observed under 254nm. Whole plant (fresh: 400g) were cut into small pieces and hydro distilled using a Clevenger-type apparatus for 3h. The oil obtained was dried over anhydrous sodium sulphate and stored in a refrigerator till further analysis. The GC-FID analysis was carried out on a Varian CP-3800 gas chromatograph operated with a splitless injector, fitted with CP Sil 8CB fused silica capillary column (30 m x 0.32 mm, 0.25 μm film thickness) with FID detector using nitrogen as carrier gas at flow rate of 1mL/min. Temperature programme: injector temperature 220oC, oven temperature 50-230oC at 3oC/min, detector temperature 250oC. Relative percentages of the components were obtained from the peak area percent reports of volatiles from GC-FID. 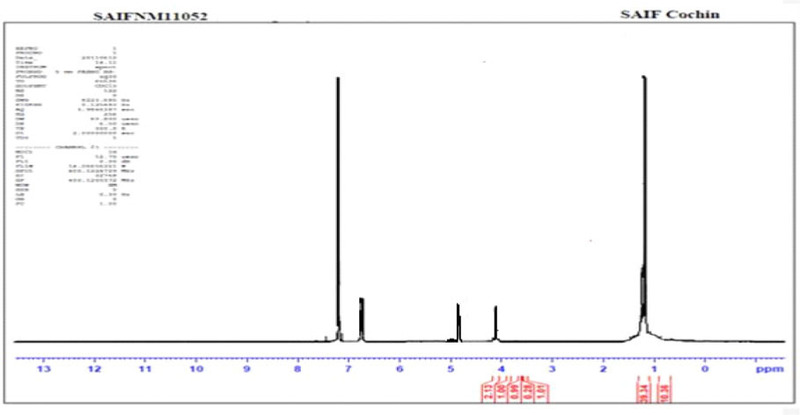 The GC-MS analysis was done on a Hewlett Packard 6890 gas chromatograph fitted with a cross-linked 5% PH ME siloxane HP-5 MS capillary column (30 m x 0.32 mm, film thickness 0.25 μm) coupled with a 5973-series mass selective detector. Splitless injection of 1.0 μl of essential oil with helium as the carrier gas at 1.4 ml/min constant flow mode was carried out. The temperature programme for the analysis was; injector temperature 220oC, oven temperature 60oC to 246oC (3oC/min), detector temperature 250oC. 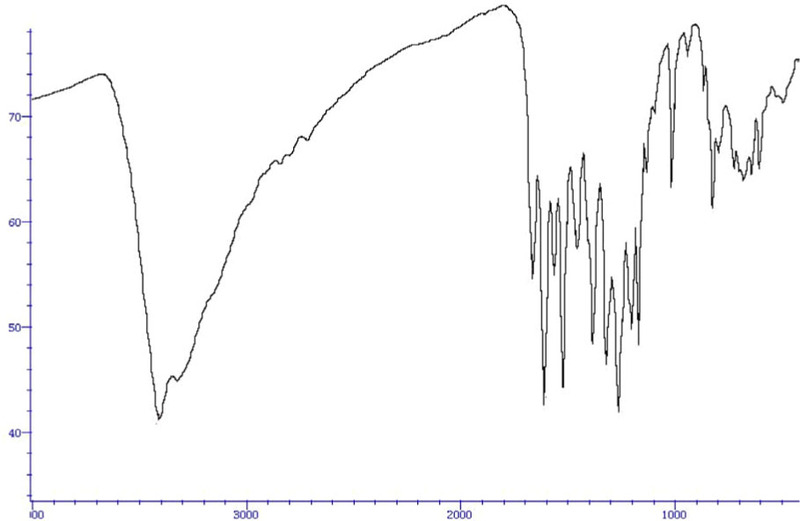 Mass spectra: Electron Impact (EI+) mode, 70 eV, ion source temperature 250oC and with mass range 40-400μ. The oil components were identified by MS library search, relative retention indices (RRI) calculated with respect to homologues of n- alkanes and compared with literature data and by comparison with published mass spectra. Superoxide scavenging activity was determined by the method of Mc-Cord and Fridovich (Mc-Cord and Fridovich, 1969). This method involves the light induced super oxide generation by riboflavin and the corresponding reduction of nitro blue tetrazolium (NBT). Super oxide anions (O2-) act as an electron reducing agent in several reactions including reduction of quinines, tetra nitro methane, cytochrome C and nitro substituted aromatics such as NBT. The reduction of NBT to blue formazan has been widely used as a probe of O2- generation in chemical and biological systems. NBT in oxidized form is a yellow compound soluble in aqueous mixture. Its reduction to formazan is accompanied by disappearance of positive charges resulting in substantial decrease in solubility, disruption of the tetrazole ring with marked modification of the absorption spectrum in the visible region and the appearance of intense blue colour. In this assay the yellow colour of the test solution changes to various shades of green and blue depending on the reducing power of the extract. Presence of reducers causes the conversion of Fe3+ / ferricyanide used in this method to ferrous form. By measuring the formation of persion blue at 700nm, it is possible to determine the Fe2+ concentration, a higher absorption at 700nm indicate a higher reducing power. Tagetes erectus plant powder (350g) was packed in a soxhlet apparatus. 3 litters of solvent were used for extraction. The plant powder was extracted with Petroleum ether (60-80oc), chloroform, and methanol for 72 h each. 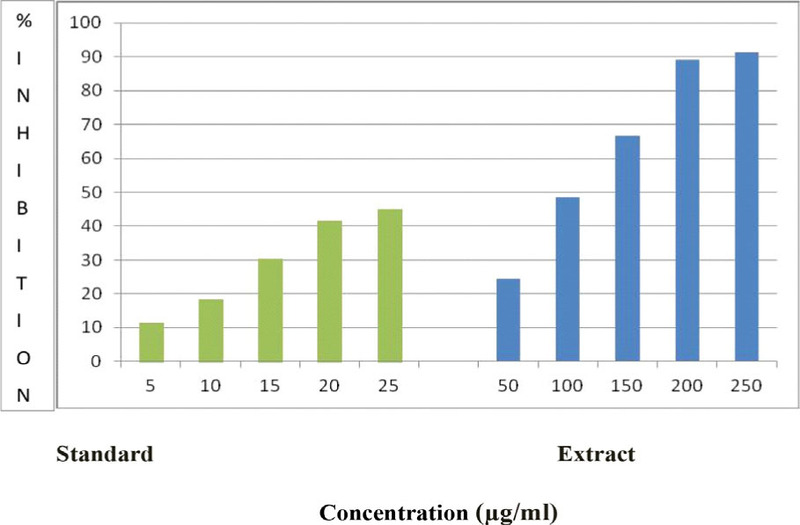 These extracts were concentrated in rotary vacuum evaporator to get 2.8, 1.6 and 1.4 g of petroleum ether, chloroform, and methanol extracts respectively The extractive values are given in Table 1. Petroleum ether extract of the plants of Tagetes erectus gave positive results for the presence of Terpenoids. Chloroform extract showed positive tests for Terpenoids, Steroids. Methanol extract showed positive test for alkaloids, carbohydrate, phenolic compound, terpenoids and flavonoids and ash values given in Table 2 and Table3. Phytochemical screening of Tagetes erectus extracts. TE-01 has been obtained as yellow crystals from ethanol, yield 500 mg, gave positive test for Flavonoid. UV, IR and NMR of the compound were taken. Identity of the compound has been done with co-TLC. IR spectrum exhibited absorption bands at 3411cm-1 which indicating the presence of OH stretching vibration of phenols, 1383.1cm-1 band indicating for the presence of OH bending of phenols, and shows a band at 1203cm-1 for CO stretch of phenol. It also shows a band at 1663.8cm-1 that indicates C=O aryl ketonic stretch and a band at 1167cm-1 which shows the presence of C-CO-C stretch and bending in ketone. It also shows a peak at 1318.9cm-1 for the presence of bending of CH in aromatic hydrocarbon. 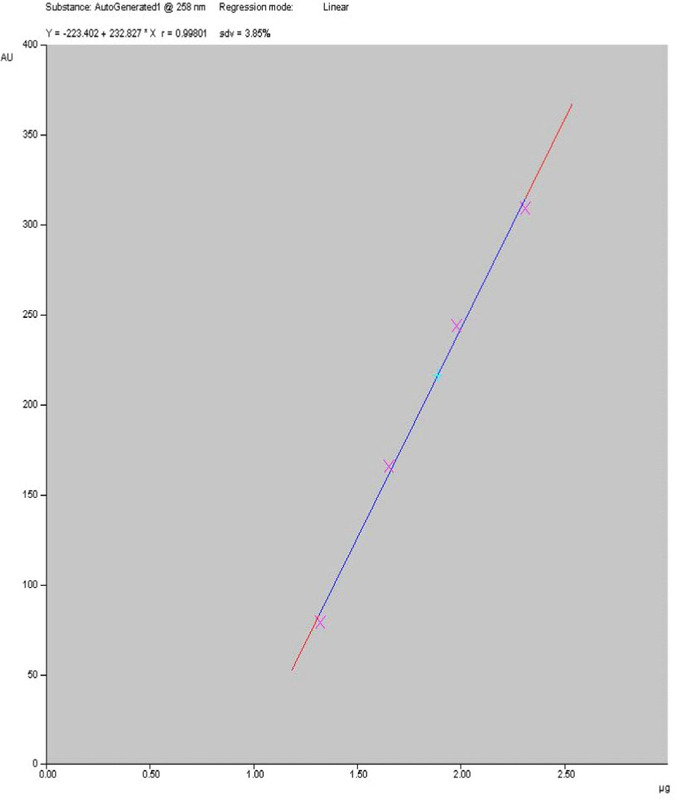 The 1H-NMR (400MHz, CD3OD): 6.274 (9, 1H, d, J=2.269), 6.439 (11, 1H, d, J=2.269) 6.813 (7, 1H, dd, J=8.430, J=2.776), 7.398 (10, 1H, dd, J=2.776, J=1.774), 7.633 (8, 1H, dd, J=8.430, J=1.774). From the results of UV, IR and NMR spectra, as well as co-TLC with authentic compound, the isolated compound was considered as quercetin. Methanol extract was estimated for the presence of quercetin. 15 mg of methanol extract dissolved in 1.5 ml of methanol. 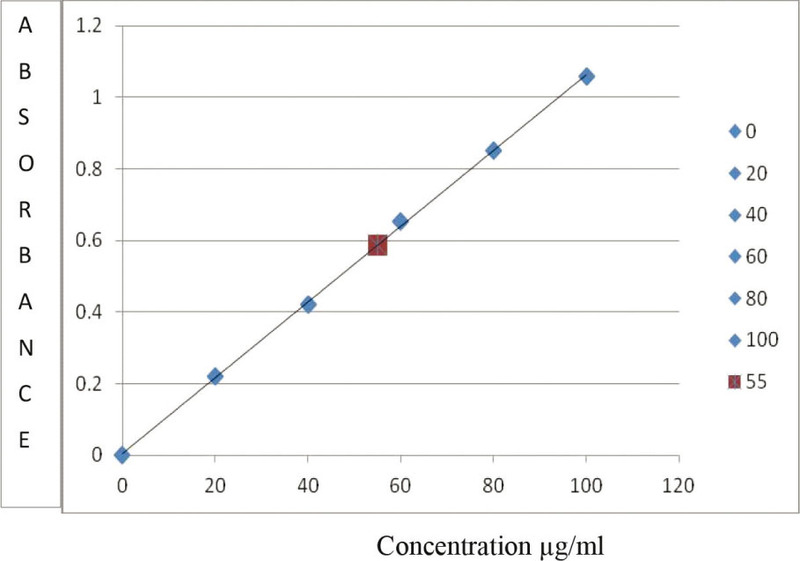 15µl and 20µl of the test solution and 1µl-4µl of stdquercetin was added. Concentration of quercetin in the extract was calculated on the area of the graph. In 15µl (150µg) - contains 1.77µg. 100µg - 1.18µg i.e. ; 1.18%. In 20µl (200µg) –contains 1.97µg quercetin i.e. ; 100µg - contains 0.985µg i.e. ; 0.985%. 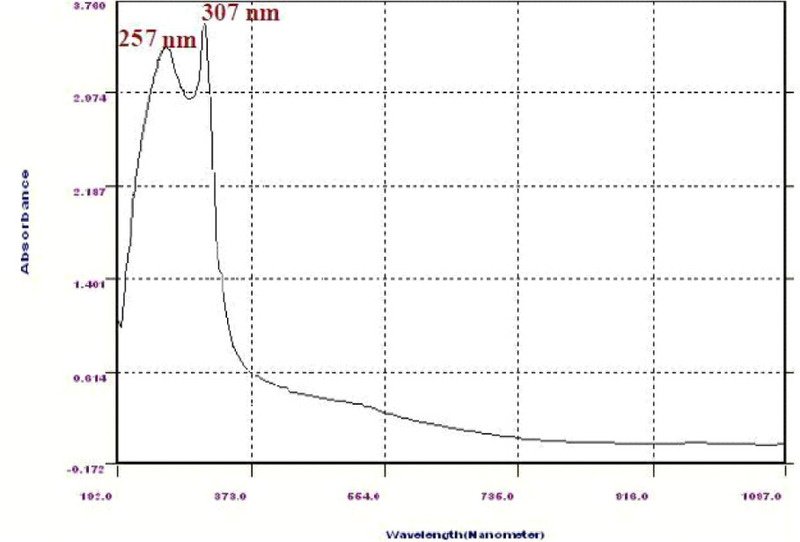 Image of the chromatographic plate is visualized under 254 nm as well as 366 nm. This visual aspect parameter is unique to HPTLC. In 254 nm, the background i.e. plate appears green or blue, due to the fluorescence indicator incorporated in the adsorbent while the fractions appear as dark spots due to fluorescence quenching. This image is non-specific as only black spots are seen on a bright fluorescent background. Common requirement of 3D images Figure 5 and 7 is to take a series of images at a fixed position, but at different focal depths. Since most microscopic samples are essentially transparent, and the depth of field of the focused sample is exceptionally narrow, it is possible to capture images “through” a three-dimensional object using 2D equipment like confocal microscopes. Software is then able to reconstruct a 3D model of the original sample which may be manipulated appropriately. The processing turns a 2D instrument into a 3D instrument, which would not otherwise exist. standard curve based on peak height. Reducing power assay method of Tagetes erectus and Standard. The peak areas of methanolic extract (15µland 20µl) and Quercetin (1µl to 4µl) concentration were recorded. The results showed linearity and the best fitting linear equation was y = 223.402+232.827x. r=0.998 and stdev is 3.85%. There was a good correlation between peak area and the corresponding concentration of methanolic extract and quercetin as shown in Figure of standard curve (Figure 8). Stationary phase silica gel and TLC plate and mobile phase chloroform: methanol (8.5: 1.5) had given good separation. The standard curve was found to be linear dependent on the concentration against area. The Folin-Ciocalteau method has the advantage of a equivalent response to different phenols, making it suitable for measuring accurate mass levels of total phenolic substances. This method depends on the reduction of FCR by phenols to a mixture of blue oxides which have a maximal absorption in the region of 760 nm. The intensity of blue staining produced is proportional to the total quantity of phenolic compounds present in the testing samples. Here gallic acid was taken as the standard. From the graph it is calculated that 400µg/ml of methanol extract contains 55µg of phenolic content which is equalent to 55µl of gallic acid contains phenolics is given in Table 4. DPPH Free radical scavenging Activity of Tagetes erectus and Standard. Super Oxide Scavenging Activity of Tagetes erectus and Standard. In this method the concentration of methanolic extract of Tagetes erectus and quercetin taken was 5-25(µg/ml). The graph is plotted against absorbance vs concentration. When the concentration increases absorbance also increases because when the concentration increased reduction of ferri form to ferrous form of ferri cyanide also increased. DPPH is a stable free radical at room temperature often used to evaluate the anti oxidant activity showed in Figure 10. The reduction capacity of DPPH radical was determined by the decrease in its absorbance at 517nm, which induced by antioxidants is showed in Table 6. Radical scavenging activity increased with increasing percentage of free radical inhibition. In this method nitro blue tetrazolium (NBT) is used as one of reagent. The percentage inhibition of NBT reduction can be used to quantify super oxide-scavenging. Percentage inhibition of super oxide can be increased with concentration is given in Table 7. In this method nitro blue tetrazolium (NBT) is used as one of reagent. The percentage inhibition of NBT reduction can be used to quantify super oxide-scavenging. Percentage inhibition of super oxide can be increased with concentration. Hydro distillation of the fresh whole plant Tagetes erectus gave light yellow oil at a yield of 0.04% (v/w). The composition of the oil is given in Table 8. A total of 25 components comprising 93.9% of the oil were identified. The oil was found to be rich in monoterpenoids (78.5%), with 26.5% monoterpene hydrocarbons and 52.0% oxygenated monoterpenoids. Piperitone (40.1%) was the major compound followed by limonene (12.0%) and terpinolene (12.7%). The present study shows indole, the nitrogenous volatile compound at low level (1.3%). The oil contained 11.4% sesquiterpenoids, with 9.9% sesquiterpene hydrocarbons and 1.5% oxygenated sesquiterpenoids. In GC-MS analysis the relative retention index (RRI) calculated by using the formula. In this method different gram positive and gram negative bacteria like Bacillus cereus, Staphyllococcus aureus, Escherichia coli, Klebsiella pneumoniae, Serratia marcescens, p.aureogenosa, Bacillus subtilis, Proteus vulgaris. 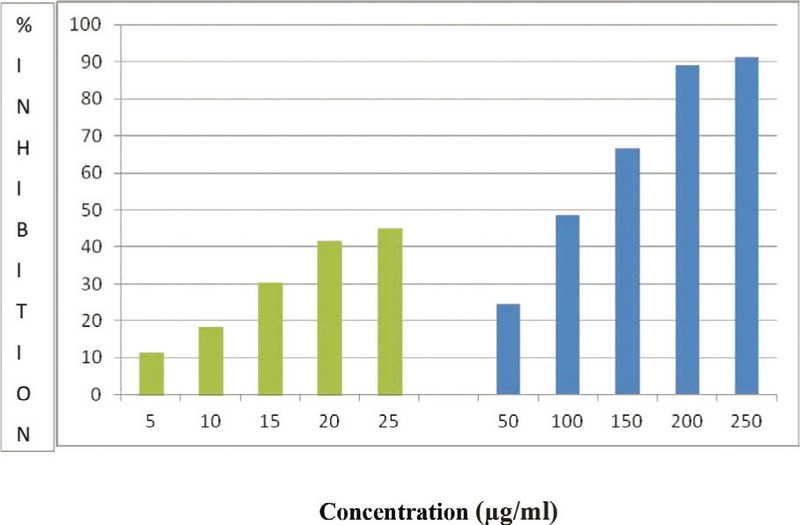 Antibacterial activity of methanolic extract of TE and oil were tested. Streptomycin used as the standard. 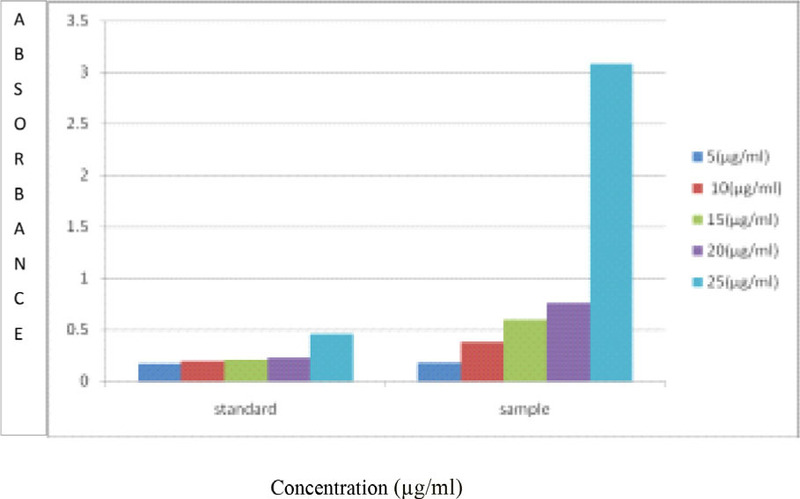 Methanolic extract shows activity against Bacillus cereus, Serratia marcescens, Pseudomonas aeroginosa, and Bacillus subtilis is given in Table 9. Oil shows more activity than standard streptomycin. The concentration of the methanolic extract taken for disc diffusion method was 40mg dissolved in 100µl DMSO. From this stock solution 10µl/disc taken. Stock solution of essential oil (40mg/100µl) of essential oil from Tagetes erectus made in DMSO. The results expressed along with the disc diameter i.e. ; 6mm. Disc diameter-6mm including disc diffusion. Antifungal assay carried out with fungus like Candida albicans and Candida glabrata. Both methanolic extract and oil of TE shows more active than standard is given in Table 10. The concentration of the methanolic extract taken for disc diffusion method was 40mg dissolved in 100µl DMSO. From this stock solution 10µl/disc were taken. Stock solution of essential oil (40mg/100µl) of essential oil from Tagetes erectus made in DMSO. The results expressed along with the disc diameter i.e. ; 6mm. Essential oil constituents of Tagetes erectus whole plant. Essential oil of the plant was distilled and its gc-ms analysis is also carried out. Monoterpenoids predominated the oil (78.5%), with piperitone as the major compound (40.1%) followed by terpinolene (12.7%), limonene (12.0%) and linalool. Further, Methanolic extract and oil has been analysed for antibacterial and antifungal study. Antibacterial assay carried out with Gram positive and Gram-negative bacteria were done using disc diffusion method. In which oil is more active towards S. aureus, K. pneumonia, E. coli than standard and methanol extract. Thus, it can be concluded that while screening of methanol extract of Tageteserectus and its oil against various Gram positive and Gram-negative bacteria andfungi oil exhibited very satisfactory inhibition. Tagetes erectus shows better antioxidant activity. These activities may be due to the presence of active constituent present in the plant and the exact constituent responsible for the activity. Tagetes erectus is used from the ancient time for its great medicinal value.It has been used in Indian traditional medicine for rheumatism, cold and bronchitis. Petroleum ether, chloroform and methanol extract of the plant were prepared by Soxhlet extraction. Pet.ether extract shows positive result form terpenoids, chloroform showed positive results for steroid and methanolic extract showed positive result for flavanoids, alkaloids, terpenoids, tannins and phenolic compounds. HPTLC fingerprinting of methanolic extract has also been carried out. In vitro antioxidant studies has been performed using the methanolic extract as it showed positive results for flavanoids.Reducing power assay method showed moderate activity. DPPH radical scavenging and superoxide radical scavenging assay showed moderate activity with IC50 values109.45(± 1.22) µg/ml and 201.53 (±4.48) µg/ml respectively. Essential oil of the plant was distilledand its GC-MS analysis is also carried out. Monoterpenoids predominated the oil(78.5%) with piperitone as the major compound(40.1%) followed by terpinolene (12.7%),limonene(12.0 %) and linalool. Further methanolic extract and oil has also been analysed for antibacterial and antifungal activity.Antibacterial activity was carried out with gram +ve and gram-ve bacteria using disc diffusion method in which oil is more active towards S.aureus, K.pneumoniae, E.coli than standard and methanolic extract. Thus it can be concluded that while screening of methanolic extract of Tagetes erectus and its oil against various gram +ve and gram –ve bacteria and fungi oil exhibited very satisfactory inhibition. Tagetes erectus showed better antioxidant activity. These activities may be due to the presence of active constituent present in the plant and the exact constituent responsible for the activity. The authors are grateful for the support and resources provided by Principal, Amrita School of Pharmacy, Kochi and Tropical Botanical Garden and Research Institute for their assistance and support. Conflicts of interest CONFLICT OF INTEREST The authors have no relevant affiliations or financial involvement with any organization or entity with a financial interest in or financial conflict with the subject matter or materials discussed in the manuscript apart from those disclosed.